Anterior teeth have a complex incisal edge anatomy that creates both the esthetic appearance of the tooth and the function of the upper and lower incisors against one another. Often in both ceramics and in composite we do not recreate the full anatomic form of the tooth. This results in both esthetic and functional challenges for the patient. When we look at incisal edges from a lateral perspective there are three components, the pitch and two bevels. The Pitch is the flat top of the incisal edge. 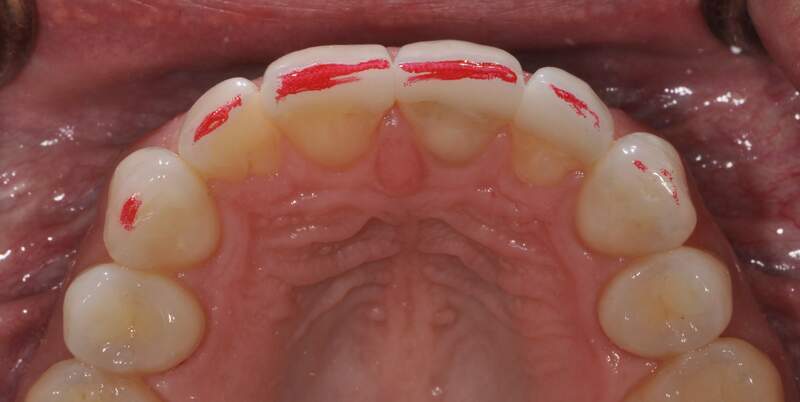 On both the labial and the lingual the transition zone between the pitch and these surfaces is a bevel. One is referred to as the leading edge and one is referred to as the trailing edge. The Pitch has dimension or labio-lingual width, usually at least 1mm. This width increases as the patient shortens the tooth from Attrition, if they parafunction in an edge to edge position. The pitch is not always parallel to the horizon, but it’s relative position depends on the inclination of the incisor. When the incisors are optimally inclined, just slightly further to the labial at the incisal edge the pitch is slanted upward toward the lingual. This creates the incisal edge esthetic effect of thinner enamel at the labio-incisal junction and creates visual translucence. If the pitch is level to the horizon it changes light reflection and the appearance of the tooth. These two factors together is often what changes in restorative material. We create a pitch that is level to the horizon, and then to gain translucence we decrease the width of the pitch, sometimes to a knife edge. The challenge with this, is that patients sit in edge to edge position often to incise food and some for parafunction. If there is insufficient width to the pitch they may experience functional challenges. The bevels on both sides have a variable width, but can be between a portion of a millimeter to multiple millimeters long. The bevels get longer in patients who grind their teeth in an excursive pathway pattern. Patients who parafunction edge to edge can often eliminate the bevel, making it easier to shear off enamel on the labial or lingual side of the tooth, or chip the edge enamel. The bevel functionally is a transition zone to create smooth functional movement as we pass from excursive movements onto the pitch. The Intercuspal stops on lower incisors is often on or gingival to the bevel. Whether we are finalizing an equilibration or finalizing the occlusion on composites or ceramics perfecting the anterior guidance requires both pitch and bevel surfaces, it is a perfect example of the marriage between form and function.